With a cover like today's WWD, left, who cares about back issues? You Balenciaga, me poor....anyway, I'm behind in my trade mag reading but January 3rd's WWD cover says: "It's Only Natural: Eco-conscious apparel is gaining momentum for 2008." Who's not happy about that? I'm ecstatic that "green" jeans are the article's focus. By the way, it's impossible to find a photo of Mr. Green Jeans online (and why did I think he had his own show? Boy I was a dumb kid). 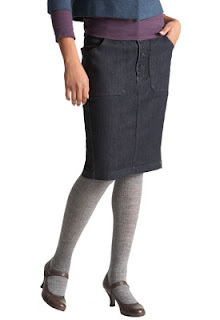 So for lack of Mr. Green Jeans pics I've shown the Levi's Eco high-rise denim skirt (right, on sale for $29.98). Please don't wear it with those shoes and tights, Mrs. BrownAnklestraps GrayStockings. Is this environmental cover story just showcasing another fleeting trend? I think not, as eco-consciousness is becoming a part of our ethos. 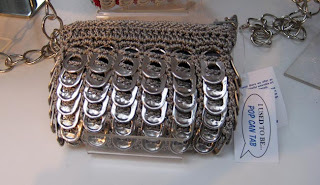 And you've got power in that cute little bag made of recycled pop can tabs by Brazilian artisans in underdeveloped communities (what a bag, below). Just this morning I saw a hipster gal on the elevator toting it around with her floaty trapeze top. That's called buying power, the young are on it, and the industry powers-that-be will follow. So what's green on 34th Street? H&M has a line of organic cotton basics, babyGap has an organic cotton collection but it's online only, and Macy's Herald Square sells Levi's & J Brand jeans, but do they carry any of their organic lines? I'm going to ask, and if you're interested in using your green to throw some eco weight around, so should you.